I began writing reviews about the books I read, before realizing those were called "reviews". I wrote them in an year old diary just to have a document the characters and place I read about, as I was reading too many books for my own good and was not able to recollect most of them when meet the rare someone who was equally interested in the books like I was. Then I began this reviewing elsewhere and of late I do in this blog. I have almost stopped writing much beyond book reviews now, though I am at least glad that (few) people seek out for my reviews. I try hard to write in detail and honest reviews, tad long they might be. I try not to give out spoilers but sometimes inadvertently (or not sometimes) I do. 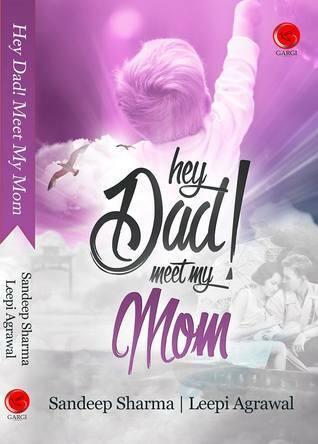 Thanks to Sandeep Sharma for lending his book Hey Dad! Meet My Mom for a fair and honest feedback. Puneet, a banker falls in love at his first sight with Myra, and coincidentally or not he starts seeing an image of a 10 year old boy visible to no one else. He is naturally shaken especially since the boy looks and behaves similar to him and continues to call him Dad. Puneet assumes it is his work stress that is getting to him while his mother brings in holy men to protect his son. The whole episode ends up in an amusing way and Puneet decides to hide the fact that he still can see the boy Rishi from everyone else just to save the trouble. It becomes easier for him to do that, as he befriends Rishi and they both plot to make Myra fall in love with Puneet. Rishi apparently is his son from future and is all set out to help find his mom. To add to his misery, he constantly dreams of another faceless woman who keeps saying to seek out to his past. With Rishi's help, Myra starts liking Puneet back and they start to date. Rishi takes a back seat during this period but the faceless woman continues to haunt his sleep. Succumbing to the pressure of his mother and Myra he agrees to visit his uncle who is a renowned psychiatrist who prescribes some more sessions and medicine. On a weekday, Rishi just appears at his office asking Puneet to rush to his house, only to find his shrink and his mother discussing him. After the doctor leaves, he confronts his mother who painfully confesses about his past. What happens next forms the rest of the story. I liked the way the story began and that the suspense was built up till the very end. There was nowhere that the book lagged in pace or want of depth in the characters (for a short book). The romantic episodes between Puneet and Myra were realistic enough and maybe cute to an extent. For a 10 year old kid, Rishi does know too much - I would probably have cringed to discuss my love life, much alone take advises from a kid claiming to be my son - that too no one that known else could see. I could sympathize for Puneet that Rishi could read his mind. Bottomline: If you wanna pick up an easy read through with Bollywood feel - try this out. P.S watch out for this place - a review of a psychological thriller from my favorite author is coming up shortly with several improvements in the blog posts.